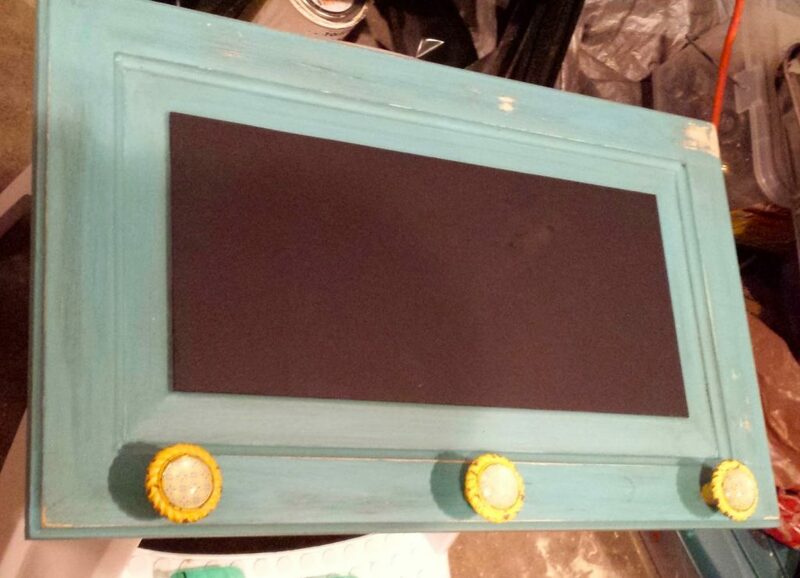 Pinterest if full of posts from people using cabinet doors to make chalkboards. This post is no different but I thought I’d show you how I did mine! I knew that for Christmas, I wanted to be able to give out something that I had made that I knew people would like. We, coincidentally, had quite a few of these cabinet doors in the garage from the kitchen we purchased off of Craigslist a few years back. That is where Pinterest came in handy and this project first took shape. I started out by filling in any holes that I knew I wouldn’t be reusing for knobs later on. 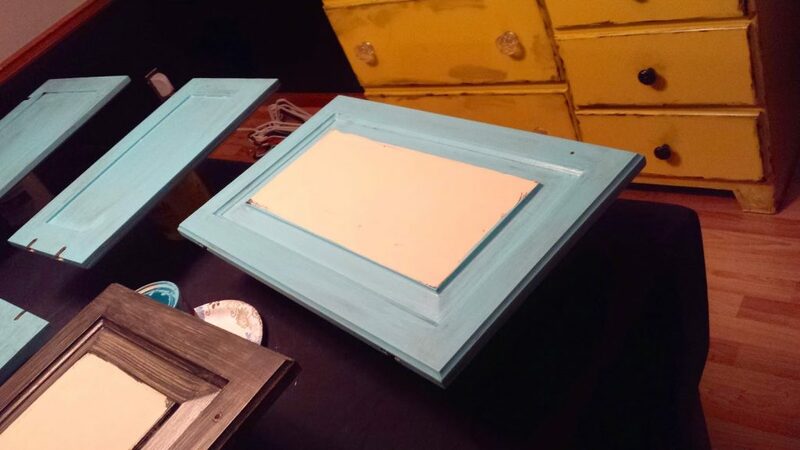 When the putty was dry, I proceeded to give the doors a good sanding and cleaning before painting. I, then, applied one coat of black paint to give some contract to the distressing process. After letting that first coat of black paint dry, I gave it a few coats of my primary color. This is the same color I used on our nursery dresser. You will notice in the pictures that I didn’t bother to paint over the middle of the door because that will be painted with chalkboard paint anyway. Why waste paint if I don’t need to, right? 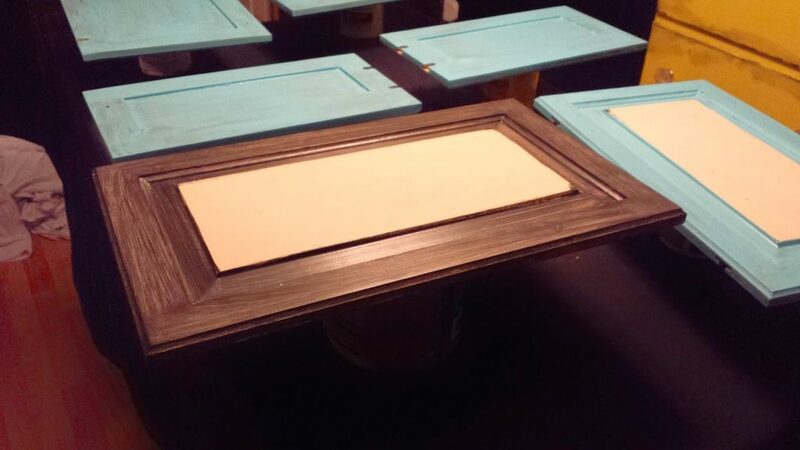 After two coats of the blue, I proceeded with the chalkboard paint. This was my first time using this paint so I opted to roll it on with a foam roller. I wanted the finish to be as smooth as possible and I knew a brush just wouldn’t give me the look I was going for. The roller worked perfectly. 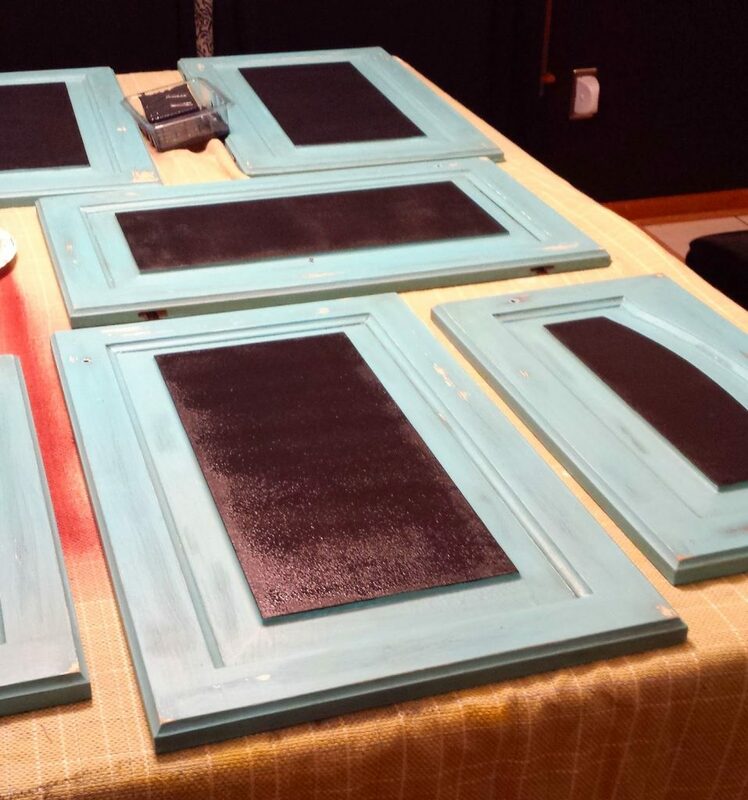 With two coats of chalkboard paint on and dry, I started with my favorite part: distressing. I sanded the edges and tops a bit and then used glazed to really bring out the contrasting colors and textures. I was really happy with how they turned out and I know that everyone that received one, really enjoyed their uniqueness as well.